Most top golf courses in the USA are for the exclusive use of club members and their guests but World Woods is a triumph for the people. Yukihisa Inoue, the president of World Woods, had a desire to provide world-class golf for all to play. With two top drawer 1993 Tom Fazio-designed courses (Pine Barrens and Rolling Oaks) and a cracking little short course that few people know about, not to mention amazing practice facilities, Yukihisa Inoue’s World Woods is an absolute must-visit pay-and-play destination. Located approximately 40 miles to the north of Tampa and 50 miles or so to the west of Orlando, World Woods is well off the beaten tourist track, but we thoroughly recommend the trip. Pine Barrens is the course that receives most of the accolades but do not overlook Rolling Oaks. Both courses are from Fazio’s top drawer but they both came from very different cabinets. There’s only one thing for it, you must play both courses, but you’ll be faced with a dilemma… which World Woods golf course do you tackle in the morning? In of itself Rolling Oaks is a fine golf course. Being right next to Pine barrens may cause a complex, but it is the age old question, which ice cream do you like better? Chocolate or Vanilla? Mary Ann or Ginger? One element of Rolling Oaks that did surprise m was the lack of undulation in the green complexes. For the most part, putts were straighter than you tricked yourself into thinking they were. The back opens with a long par 5 paralleling 9, this water hazard is really the only one of any magnitude on the entire course. The par 4 downhill 12th is one of the shorter par 4s. It can be devilish. Aim left of the tee. The fairway bunker looks a lot closer than it is. You don't want to be in it and if you fly it you will probably end up in the ravine, Long hitters may want to leave the driver in the bag. The 13th is a long par 3 with interesting random rock outcroppings in the wast area short of the green. The number one handicapped hole 15 is demanding but fair. Slight dogleg left, off the tee stay right to avoid the bunker on the inside elbow. The green is elevated and protected by two bunkers on the left side. Avoid these at all costs. Hit an extra club on your approach. The 18th is a short par 5 and a super finishing hole. If you are down you can make your move here. Take dead aim down the middle. Too far right and you will have some tree challenges and too far left you will need to draw your ball into the green. It is reachable but the uphill sandtrap protected redan green may make you think twice. 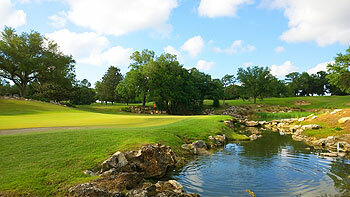 I enjoyed playing Rolling Oaks. I think it is over rated and thus i am glad that i opted to play at a twilight time where the greens fee dropped by more than half. World Woods is an amazing place ! two great courses in my view pine barrons is nicer so i always try and play rolling oaks first , best value for money tee off earley playing rolling oaks stop for lunch and play pine barrons in the afternoon for a great day out ! Played Rolling Oaks last week and Pine Barrens the next 2 days in the late afternoon. The practice facilities are awesome and World Woods is a golfers paradise that designer Tom Fazio said, "This is my best work." Fazio has described World Woods as being comparable to having Augusta National, Pine Valley and the finest practice facility in the world, all in one location. Rolling Oaks is the more traditional in design and the fairways are lined with live oaks, dogwoods, and magnolias that complement large, multi-tiered greens and cavernous bunkers. The course in a par 71 that measures 7,333 yards from the championship tees to 5,943 yards from the white tees. The course was in excellent condition and I thought the greens on Rolling Oaks rolled a little better than Pine Barrens and were faster. The first hole starts out with a nice 424 yard par 4 that a drive down the right side gives a better angle to the green. The second hole is a 207 yard par 3 that is protected on the right by a large bunker. The third is a 574 yard par 5 with the left side better on the drive as bunkers protect the right side. Bunkers are on both sides of the lay up and the green is protected on the right by a large bunker and a large oak protects the left side of the green. The fourth is one of the shorter par 4s on the course at 395 yards and a drive down the right side makes this a good birdie opportunity. The fifth is a 551 yard par 5 that doglegs slightly to the right with a drive down the left side the better angle but the large bunker on the left must be avoided. The green is protected on the front right by a large bunker. The sixth is the shortest par 4 at 341 yards that doglegs slightly to the left. A drive down the right side gives a better angle and is another good birdie opportunity. The seventh is a long 472 yard par 4 with a drive down the left side the better angle as the right side is protected by a large bunker. The green is protected on the left and short by another large bunker. The eighth hole is a downhill 173 yard par 3 that is the most scenic on the course and is protected short and left by a large pond. The wind seemed to be swirling more on this elevated tee and made club selection more difficult. The ninth is another long 460 yard par 4 with the drive favoring the left side the better play. The green is protected on the right by a bunker and another on the left about 50 yards short of the green. This green has 2 tiers and it is essential to get the ball on the correct tier as I thought this green was one of the more difficult ones to putt. The tenth is a long 606 yard par 5 with bunkers protecting both sides of the fairway and on the 2nd shot. The green is elevated and is protected on the right and left by large bunkers. The eleventh is a 440 yard par 4 that plays shorter than that distance as the drive is downhill and the left side is the better angle to the green. The second shot is uphill and the green is protected on the left and right by large bunkers. The twelfth is a relatively short 372 yard dogleg right par 4 that a drive down the left side is the preferred angle to the green on the second shot. The downhill 238 yard par 3 thirteenth is protected on the right by 2 large bunkers. The fourteenth and fifteenth are two strong par fours that measure 447 and 480 yards and both dogleg to the left. The fifteenth is the number 1 handicap hole on the course and the green is protected by 2 large bunkers short of the green. The sixteenth is a downhill 233 yard par 3 that is protected on the left by another large bunker. The 17th is a dogleg left par 4 that measures 400 yards with bunkers protecting both sides of the fairway. The green is protected on 3 sides by bunkers. The round finishes with a 505 yard par 5 that doglegs slightly to the right and the better angle is to the left on the drive. The green is protected by 7 bunkers and I thought it was better to lay up to the right on the second shot as it was a better angle to the green and a good birdie opportunity.